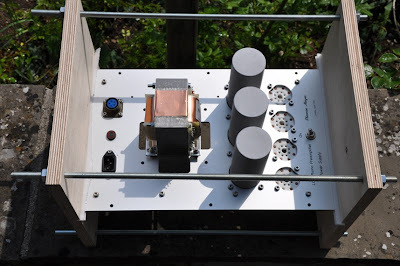 After the introduction of the magnificent EC8020 triode in the last post, I'm going to show the assembly process of a LCR RIAA phonostage based on this tube. The circuit is two stage, all transformer coupled, 600 Ohm LCR RIAA between them. 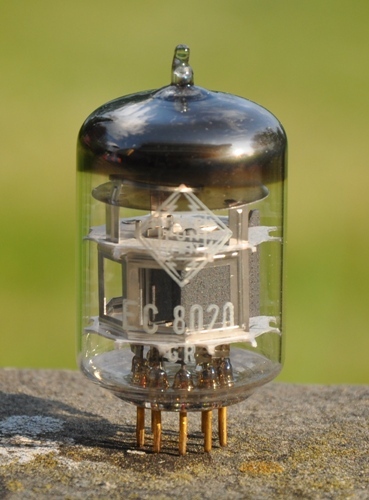 Both stages use the EC8020 tube. 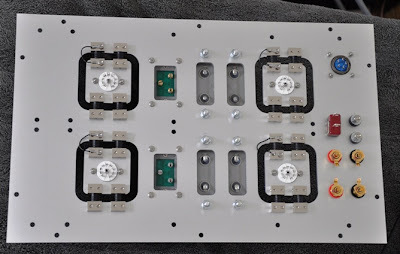 To control microphonics, each socket is mounted on a subassembly which is fixed to the main plate through rubber damping elements. The photos on the left show a single sub assembly element. The rubber elements come with 3mm threads on both ends. These get screwed into threaded metal blocks which in turn can be fixed to the metal plates. The rubber elements have the right softness, not too hard and not too soft. If they are too soft, the sub assembly would wobble in the main plate and could act like a microphone, picking up the sound from the speakers of the system. If they are too hard, the damping effect is not there. As chosen, they don't pass vibrations from the main plate to the socket assembly. Any virations picked up by the tubes through the air is damped (converted to heat in the rubber). Although the EC8020s are not very microphonic, this damping system ensures a very quiet operation. 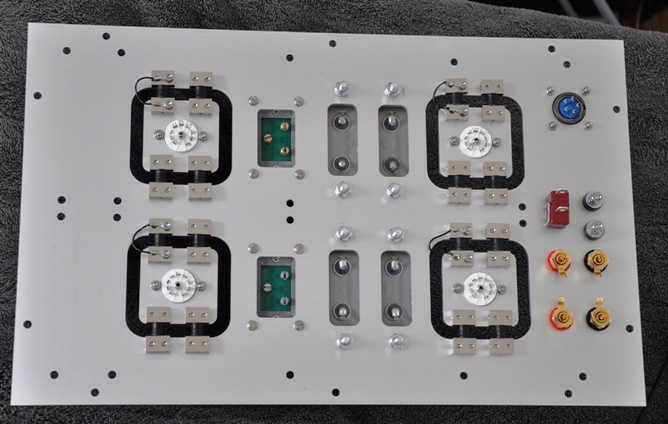 Since the small pates are electrically isolated from the main chassis by the rubber elements, a wire is added so that all metal parts are grounded. 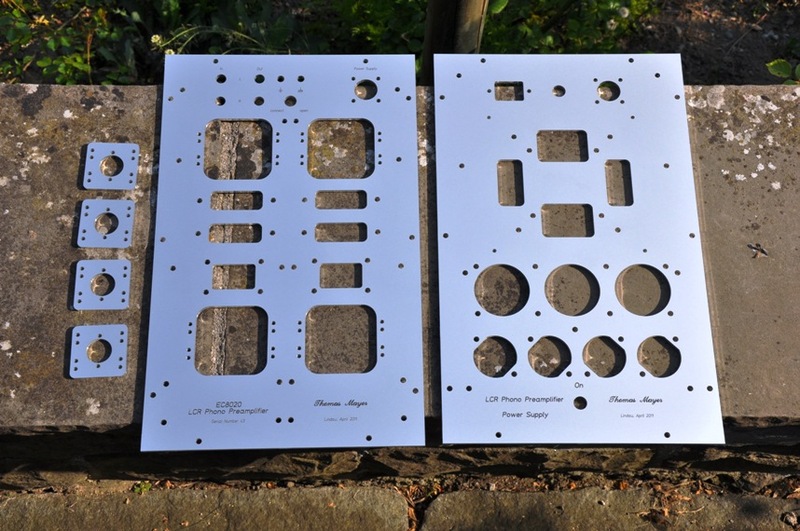 Otherwise the isolated metal plates could pick up stray fields and cause hum. 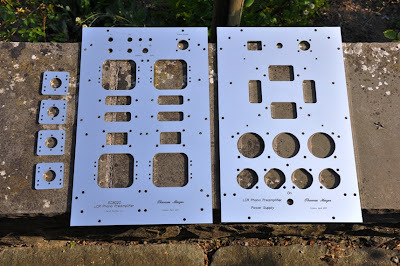 The next photo shows the main plate with all parts mounted. 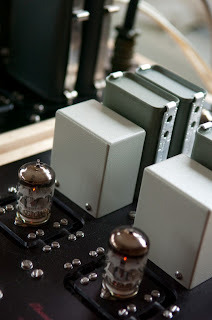 LCR RIAA modules in the front and 4 old stock paper in oil capacitors, one of them for each tube stage. The caps are manufactured by a company called Filtron. I found these to be superb sounding and just the right fit for a EC8020 phono stage. 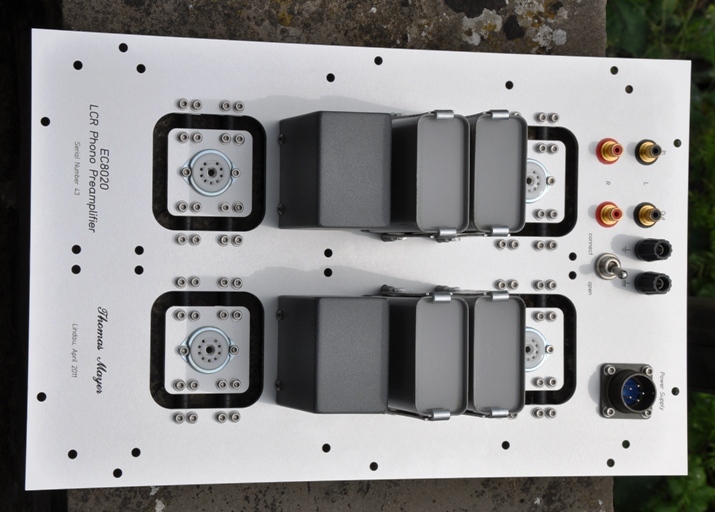 The two black connectors are separate jacks for signal ground and chassis. With the switch in front of them both can be electrically connected or left unconnected. This gives maximum flexibility to adjust the grounding to any system configuration. Some turntables have separate ground wires from the disc platter which can be either connected to signal ground or the chassis terminal. The signal ground terminal is normally used for the tonearm ground wire. Interstage transformers, chokes and more capacitors will be mounted inside on a second tier. The main power transformer will be mounted on the top side and hidden under a transformer cover. 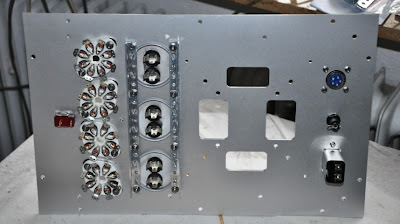 Another transformer for the heater supply will be placed inside the chassis along with 4 chokes, 3 for B+ filtering and one for the heater supply. 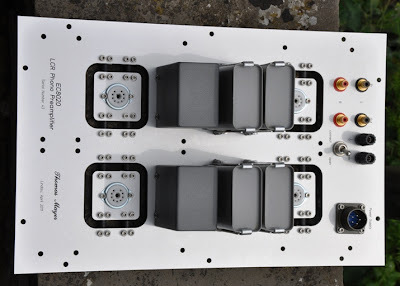 The last photo shows the PSU plate mounted into an assembly jig which makes handling very easy and avoids the danger to scratch the plate while working on it. Stay tuned for part 2 which will show the wiring. So far tubes presented in this series were less known in the audio scene, cheaply and easily obtainable. Now it's time to also go to the other extreme and to present some of the rarer kind. I'll start with the tube many of you probably waited for, since I'm known for using it quite a lot. The Telefunken EC8020. This is my all time favorite of the indirectly heated tubes. This tube has been developed in the 60ies by Telefunken. As far as I'm aware no other manufacturer ever made real EC8020s. There are currently manufactured tubes which are claimed to be close in parameters, namely the russian 6C45. While it might come close in terms of transconductance it is light years away in terms of stability of parameters, quality of manufacture and most important sound. The only tube which comes close is the WE437. But for me, the Telefunken EC8020 is the queen of the small signal high transconductance tubes. The EC8020 comes with a noval 9 pin base. In contrast to other typical noval tubes like 12AX7, ECC88, 6DJ8 it has a much fatter glass bottle to contain the rather large plate structure. 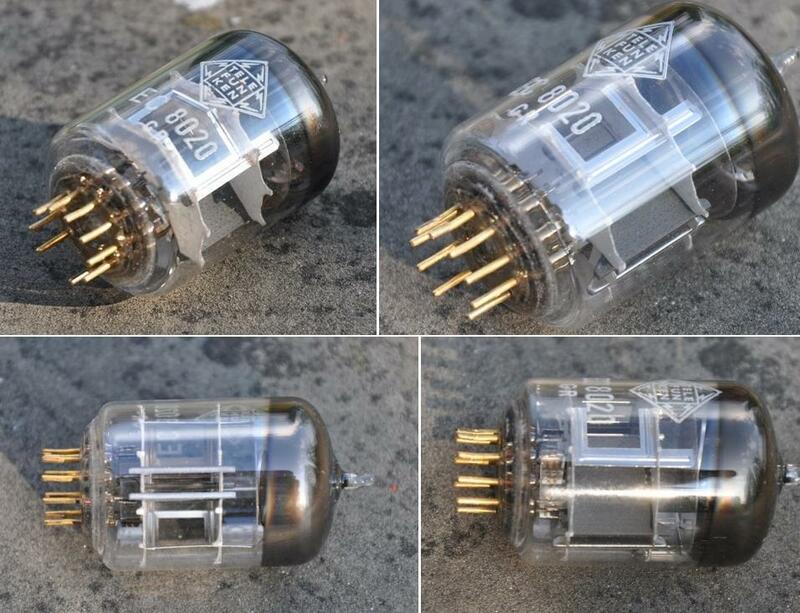 In fact it is a small power triode with a plate dissipation of 8W. Detailed technical data can be found here. The tube has a whopping transconductance of 65.000 micromhos (65 mS). The amplification factor is 55. This results in a plate resistance well below 1kOhms making the tube suitable for phono preamplification using transformer coupling. 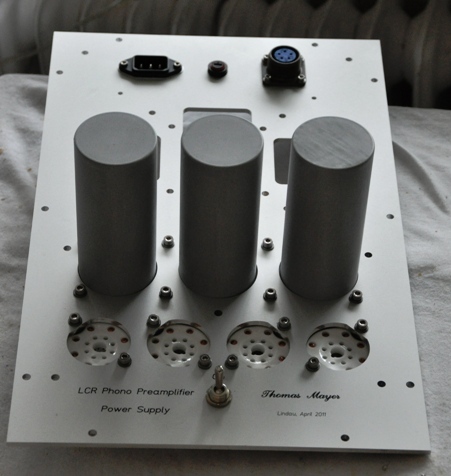 This is the main application for which I'm using this tube, transformercoupled LCR RIAA phonostages. 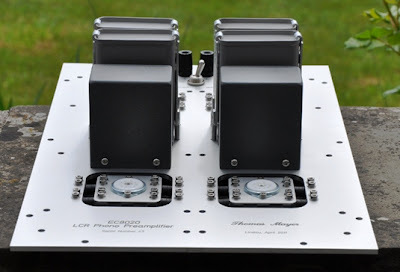 The low plate resistance allows to drive a 600 Ohm LCR RIAA network with a transformer with a slight step down, preserving the majority of the gain. The EC8020 really shines in this application, enabling very low noise phono preamplifiers. With the high plate dissipation the EC8020 can even be used as a power tube. 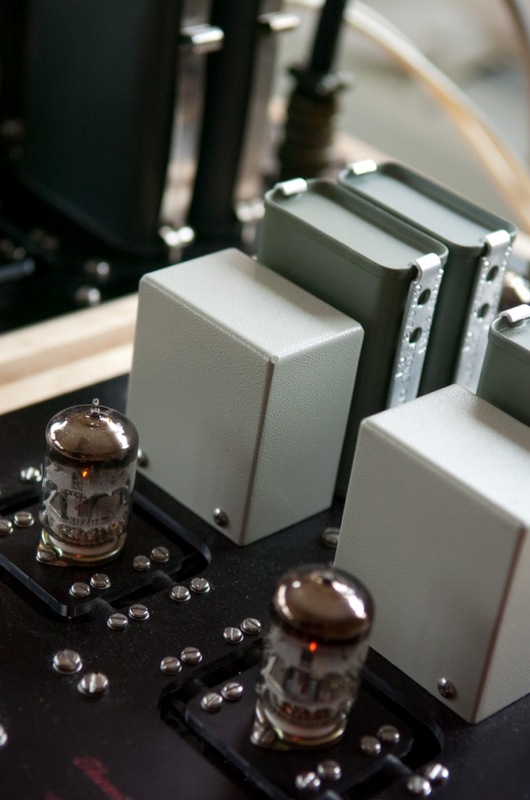 A single stage, 1 tube per channel SE amp can be built with it. It is able to deliver up to 1.5W in such a circuit with a suitable 5k output transformer. As with all high transconductance tubes, careful layout and some precautions are necessary to keep it from self oscillations. I usually apply ferrite beads to the grid leads. With these measures it will work even with tiny input signals as those from a phono cartridge with very low noise and low microphonics. The tube has exceptional linearity as can be seen from the photos below which show the plate curves, taken from an actual tube with a curve tracer. The two shots are taken with different settings for the grid voltage steps. Unfortunately the EC8020 has become very rare and is difficult to find. A good friend of mine once said, EC8020s are carved out of solid block of unobtainium. Even at current prices which are being asked for EC8020s, I think they are absolutely worth it. I have never seen original price lists from Telefunken, but a reputable source once told me that Telefunken sold these in the 1960ies for 80 Deutsch Marks to the industry in quantities. They probably have never been available to amateurs in single quantities back then. A truly magnificent piece of engineering. Given the tiny tolarances and grid spacing this can be considered as micro electronics. I'm about to start construction of a custom LCR RIAA phonostage with this tube. I will document the assembly process in upcoming posts. 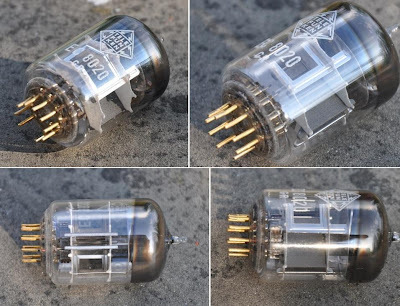 The photo on the left shows a close up of a phono preamplifier based on this tube. This is my main phonostage which I use every day. I've been using EC8020s for a very long time and never had any reliability issues with it. 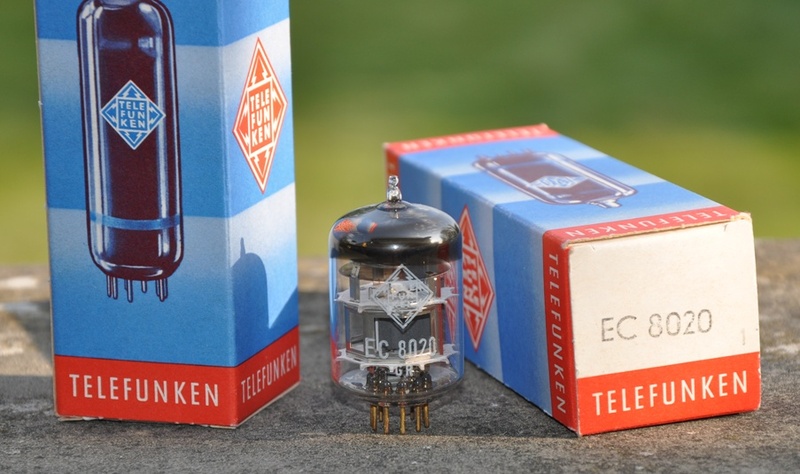 It was classified as a long life tube by Telefunken. They guaranteed an average life of 10.000hrs. 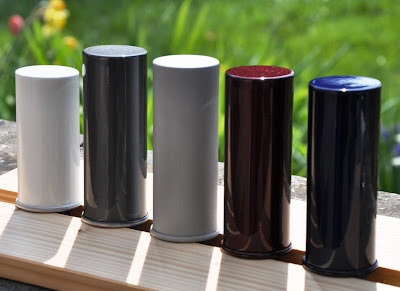 Besides the finishes which I already had (metallic white, metallic graphite, sandblasted with clear coatings) I now also have bordeaux red metallic and dark blue metallic. The caps shown are ASC X386S series. The white one is 30uF/330VAC and the others are 30uF/440VAC. Also available in the same colors: 25uF/330VAC and 40uF/440VAC. I especially like the new red and blue ones. First I was a bit sceptical if I should get the caps in such colors. But I like the result. The metallic finish is quite a lot of effort. First the caps need to get cleaned and sand blasted. Then a base coating is applied, followed by 2 coatings of the color. Then they get finished with a shiny clear varnish. Besides the finishes on the photo there is also standard silver and black. Transformer covers are also available in the same coatings, except sand blasted. On Saturday, June 4th, I will attend the Annual Cool Gales Analogue Fest. I will demo the Octal Preamplifier, a Single Ended 45 and a Single Ended 6CB5A amplifier. The event is hosted by Cool Gales and will take place at the Bath and County Club in the beautiful city of Bath. No registration is necessary for visiting the event. There will be an admission fee of £3. 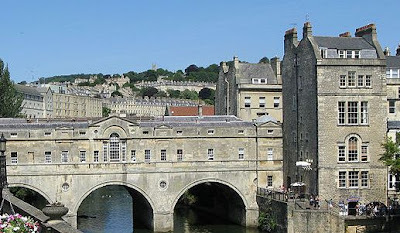 All proceeds of the admission will go to a charity. I'd be glad to meet you there and give a demo of my gear. There will also be the chance to listen to a lot of other interesting systems.